Video is the new holy grail for recruiting content. The stats on why video is essential across multiple facets of your business are endless, but it seems the recruiting video market is virtually untapped. Recruiters are still utilizing traditional methods to reach potential candidates - from email to cold calling and everything (old) in between. Marketing utilizes video to reach and interact with customers and leads, but why aren't more companies using it for recruiting? We're not sure - it seems like a no brainer to us. It's time for talent acquisition leaders and recruiters to start using video in their efforts to recruit top talent candidates. This year, we're taking the opportunity with some of these silly National Days to share some of our favorite recipes for successful videos! And this month, we're celebrating National Cheeseburger Day. 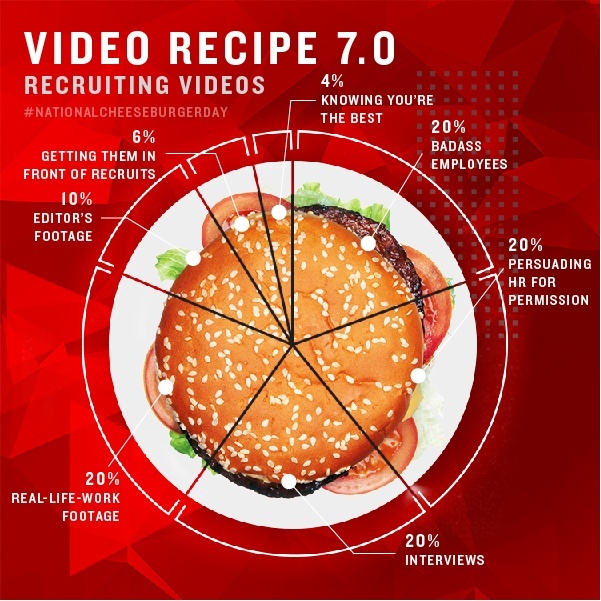 Here is our recipe for great recruiting videos for your business. Check out the full-size graphic, here. It's time to harness the power of video.